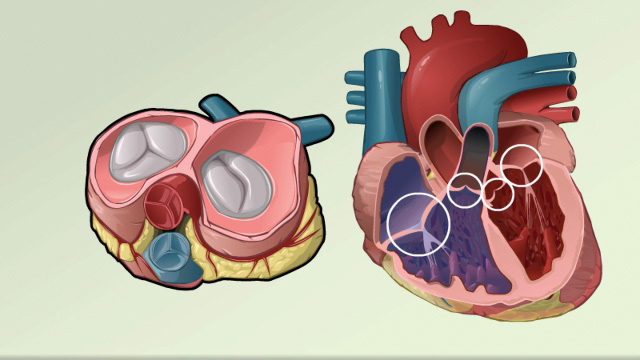 Pulmonary valve stenosis is a heart valve disorder that involves the pulmonary valve. This is the valve separating the right ventricle (one of the chambers in the heart) and the pulmonary artery. The pulmonary artery carries oxygen-poor blood to the lungs. Stenosis, or narrowing, occurs when the valve cannot open wide enough. As a result, less blood flows to the lungs. Narrowing of the pulmonary valve is most often present at birth (congenital). It is caused by a problem that occurs as the baby develops in the womb before birth. The cause is unknown, but genes may play a role. Narrowing that occurs in the valve itself is called pulmonary valve stenosis. There may also be narrowing just before or after the valve. The defect may occur alone or with other heart defects that are present at birth. The condition can be mild or severe. Pulmonary valve stenosis is a rare disorder. In some cases, the problem runs in families. Many cases of pulmonary valve stenosis are mild and do not cause symptoms. The problem is most often found in infants when a heart murmur is heard during a routine heart exam. Symptoms may get worse with exercise or activity. The health care provider may hear a heart murmur when listening to the heart using a stethoscope. Murmurs are blowing, whooshing, or rasping sounds heard during a heartbeat. The provider will grade the severity of the valve stenosis to plan treatment. Sometimes, treatment may not be needed if the disorder is mild. Percutaneous balloon pulmonary dilation (valvuloplasty) may be performed when no other heart defects are present. This procedure is done through an artery in the groin. The doctor sends a flexible tube (catheter) with a balloon attached to the end up to the heart. Special x-rays are used to help guide the catheter. The balloon stretches the opening of the valve. Some people may need heart surgery to repair or replace the pulmonary valve. The new valve can be made from different materials. If the valve cannot be repaired or replaced, other procedures may be needed. People with mild disease rarely get worse. However, those with moderate to severe disease will get worse. The outcome is often very good when surgery or balloon dilation is successful. Other congenital heart defects may be a factor in the outlook. Most often, the new valves can last for decades. However, some will wear out and need to be replaced. You have symptoms of pulmonary valve stenosis. You have been treated or have untreated pulmonary valve stenosis and have developed swelling (of the ankles, legs, or abdomen), difficulty breathing, or other new symptoms. Pelikka PA. Tricuspid, pulmonic, and multivalvular disease. In: Zipes DP, Libby P, Bonow RO, Mann DL, Tomaselli GF, Braunwald E, eds. Braunwald's Heart Disease: A Textbook of Cardiovascular Medicine. 11th ed. Philadelphia, PA: Elsevier; 2019:chap 70.